National flags are by definition national identifiers. Confederate flags are those flags adopted by the Confederacy in its quest to be a nation and were intended to serve as a symbol of the Confederate nation. 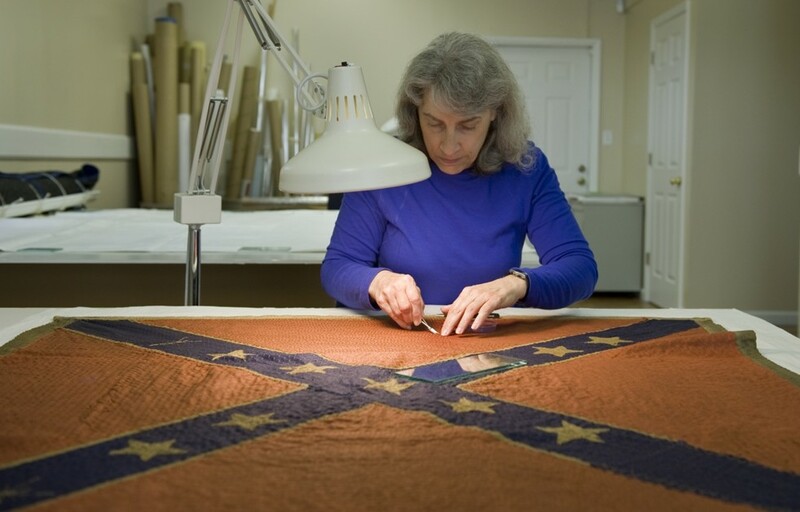 The conservation of flags, like the conservation of any historical artifact, is a legitimate activity for a museum. However, flags are powerful instruments of national identity and act as such – it is the purpose for which they designed. The MOC uses Confederate flags as symbols that both assert and reinforce Confederate national identity. Sebesta seems to think that the financial support for this project by the Sons of Confederate Veterans implies that the flag’s restoration is for their benefit only and that its purpose is to keep alive the Confederate cause. This is absurd. First, there is nothing necessarily wrong with the SCV offering financial support to the museum nor is there any conflict of interest for the MOC in accepting and publicizing it. The flags belong to all of us. What Sebesta does not reference is how much support for the MOC’s flag restoration comes from individuals and organizations other than the SCV. This has nothing to do with the preservation of “Confederate national identity.” Why shouldn’t these flags be preserved? They are a tangible connection to our Civil War and invaluable to our understanding of how white southerners made and maintained Confederate identity. Once again, Sebesta makes no effort to talk to Waite Rawls or John Coski about why their flag preservation program is important and how it is used to tell the MOC’s story to the general public. He makes no attempt to talk with museum officials about their mission and the unique challenges they face in the former capital of the Confederacy. The notion that this is about maintaining a living Confederate identity/nationalism is even more absurd given John Coski’s widely regarded critical study of the Confederate flag. Sebesta makes no mention of it. What he does make a big deal of are the many trinkets that the museum store sells that display the Confederate flag. Flags are clear markers of national identity and the MOC, and its store, The Haversack, sells Confederate flags both at the museum in Richmond and through its MOC Magazine, enabling visitors and readers to acquire these symbols of national identity. A visitor to, or member of, the MOC is given the opportunity to purchase numerous objects with various Confederate flags marked, affixed or otherwise made part of the purchase. I should come clean and admit to purchasing a few of these over the years as gifts and souvenirs. So, what does that make me? What I find truly disturbing is that Sebesta fails to offer a single shred of evidence in this series that he has ever taken the time to visit the Museum of the Confederacy in Richmond. Stay tuned for the final installment, which “ends with a call for previous winners of the MOC awards to repudiate them and for historians in the future to reject them.” Yes, you may remember that Sebesta announced his own intention to reject any nomination of his own book for an MOC award. Perhaps he should contact the recipients of these awards to see what they have to say about the MOC. In the end, I suspect he will have as much success as he did with his petitions to President Obama to discontinue sending a wreath [and here and here] to the Confederate monument at Arlington National Cemetery. This is exactly what faux Southerners do…they bow to “political correctness” and whatever group…NAACP, SPLC, etc. happens to be screaming the loudest at the time. The faux Southerner is a pariah and has no place in Southern society. Well if enough of Southerner’s could be there and STORM the Fort at one time , We could Raise the First Flag Ourselves and I know It would be a Big Old Confederate Flag . Dang just think How Proud Our Ancestors would be . This is a slap in the face to all of us that are proud of our Hertiage. I live less than 20 miles from this disgrace (Museum). I will be making calls to try and right this WRONG. I belong to the UDC and my husband belongs to the SCV, please tell me these org. are not okay with this outrage. I know CIC Givens will see this as the outrage it is. I am afriad and ashamed I cannot be as certain about the UDC. I am led to believe that the seven SCV Camps that the Museum of the Confederacy director, Waite Rawls (the Traitor) claimed had endorsed his evil plan to ban the National Flag of the Confederacy from the exterior of the new museum and instead fly the union occupation flag, we all lies. I am told that the commanders of the SCV Camps that Rawls slandered in his lies are fighting mad. Rawls is a fast talking used car salesman type and he has been caught in his lies before – remember when he offered to delete the word “Confederacy” from the name of the museum so as to not offend anyone! The very thought of flying the flag of the conquerors at a site considered a memorial to our Confederate Soldiers is an abomination! There’s more, but you get the idea. The idea that the MoC is somehow pandering to these folks is ludicrous. This guy has absolutely no interest in exploring the museum’s history and culture. The research is so incredibly shallow. He spends most of his time on the museum’s newsletters. Furthermore, I applaud the MOC for supporting this project. The more money the better. This is just the kind of project that they should be involved with. Excellent post, Kevin. I’ve been to the MOC and it is not even remotely neo-Confederate. I greatly admire John Coski (and not just because, on a very dark night after a program, he got in his car and had me drive after him through the badly marked and convoluted lanes of the University of Richmond to the highway after I kept getting lost & ending up where I started.). His work on the history of the use of the Confederate flag is critical to understanding its impact. I don’t think it likely Sebasta could have been to the MOC; if he was, he viewed everything with such a closed mind that he saw only what he wanted to see. Yes, I confess, I have bought merchandise (including books) with the Confederate flag on it; I don’t think anyone who knows me would describe me as a neo-Confederate. Someone made the obvious point on the CWM Facebook page that most Civil War related sites sell items with Confederate flags. John is respected by everyone and incredibly nice guy. John and the rest of the staff have worked very hard over the years to maintain and even expand the museum’s interpretation and public outreach. It’s a wonderful place. Sebesta is completely off base. If selling things with a Confederate flag on them makes a place a “pro-Confederate museum” then I’ve been in quite a few truck stops that are apparently branches of the MOC!!! I visited the MOC a few years ago and was surprised by it’s exhibit on slavery. However, what do you think about Sebesta’s observation that the museum is a reliquery of Confederate sacred objects? I go to a lot of museums in the US and Canada and except for Graceland, have rarely seen the public experience the artifacts in quite the same way. I would note that our guide did give us memory-informed tour telling us how some objects had been used to further Lost Cause interpretations. Overall, my wife and I were pleased with the presentation at a museum that frankly my family only visited after much discussion. However, what do you think about Sebesta’s observation that the museum is a reliquery of Confederate sacred objects? The museum started out as such, but Waite Rawls constantly reminds the public that the MOC is a museum about and not for the Confederacy. Of course, some people do see some of their holdings as sacred objects as do many American who visit the founding documents on display at the National Archives in Washington. I’ve also been to the MAWHOTC and I have a refridgerator magnet from there. I think it’s a great museum and would love to go back. I think that museum is the absolute best, most appropriate place for display and interpretation of the Confederate flag and related symbols. It should not be forgotten that there is real history to be displayed and understood there. I don’t know really anything about Ed Sebesta except that he co-authored “The Confederate and Neo-Confederate Reader: The ‘Great truth’ About the ‘Lost Cause. '” with James W. Loewen, whom I consider a very good historian and author- Lies My Teacher Told Me, Lies Across America, and Sundown Towns. Not sure why Sebesta is labled a “Neo-Confederate Crusader” in this article, as his book with Loewen is an answer to those who glorify the Confederacy. Sebesta’s blog is called Anti-Neo-Confederate. I’ve made extensive use of the Loewen-Sebesta Reader in my classroom. I don’t know of anything that he has written that would count as history. Sebesta has done a great service by putting online the newsletters of the segregationist Citizens’ Councils that helped coordinate “massive resistance” against the Civil Rights Movement. But he’s too shrill for his own good sometimes, and his own worst enemy. It is one thing to be criticized for what you have said, but it is another thing entirely to be criticized for something you haven’t said at all. I don’t say that the MOC has a central role in the neo-Confederate movement. When you get upset, you just throw up stuff into your blog whether the person said it or not. You also use the word “implies” alot to do much the same thing that is to assert a person is claiming something that they didn’t claim. In the 4th installment I make it clear that the MOC stands for institutional self-interests and presents itself differently to different audiences. There is a difference in being neo-Confederate and pandering to neo-Confederates. You also misrepresent my writing on flag preservation. Preservation is a legitimate activity of any historical society, museum, or other society. However, the point of my article is how the MOC conducts these preservations and represents these preservations and what meaning they ascribe to it. The point of this section isn’t engaged. Your posting is uninformed by modern academic understanding of the role of museums and how they function. My third installment was also greatly informed by a study of Christian materiality in Medieval times. None of this is referenced in your blog posting. Also, all the name calling, which you approve as moderator, and your personal attacks, really discredits the arguments against me. It shows a good ole’ boy network raging. The 3rd installment is not engaged intelligently by your posting or the comments on this blog. You will be happy to know that the 4th installment discusses a visit to the MOC by a person who is a professionally qualified to understand museums and as part of the appendix, has his entire report. However, the point of my article is how the MOC conducts these preservations and represents these preservations and what meaning they ascribe to it. The point of this section isn’t engaged. Apart from museum newsletters you provide very little evidence to support your claims about the goals of the museum’s flag preservation program. You are absolutely right. My understanding of the MOC is based on numerous research visits, class visits, and interaction with many of their staff members. I hope that person is you. That you apparently have never visited the MOC or made an attempt to talk with employees is a poor reflection on you. Have you ever visited the MOC? What do you think about Andy Hall’s comment? There is a sizable group in the Southern Heritage crowd that believes the MOC has lost its way. Kevin, feel free to ignore this but I wanted to point out that it doesn’t seem to be the Southern Heritage crowd but the Confederate Heritage crowd. I don’t consider them to be one and the same. Not sure what point you are making here. Perhaps you can elaborate. Thanks. I’m saying that even though Confederate heritage *is* part of Southern heritage, the Confederate heritage folks would have one believe that Confederate heritage is the be all and end all of Southern heritage. I know many people who are proud of, and deeply interested in, their Southern heritage. It’s not these people who see “heritage violations” and “slaps in the face” behind any act that doesn’t sit well with UDC and SCV. It’s the folks who have concentrated on one aspect of Southern heritage, i.e., the Confederate heritage folks. You are correct in saying a “sizable group in the Southern Heritage crowd. . .,” since Confederate heritage afficionados are a part of that. I was just saying that I, personally, prefer to not group them under the general umbrella of “Southern heritage.” It runs the risk of giving the wrong impression of folks who are genuinely interested in Southern heritage without the apologist baggage. Just my thoughts and opinions. No offense intended. Thanks for the follow up. I surely did not mean to suggest that I was offended. You make a good point. It is a magazine, not a newsletter, and it is the official publication of the MOC in which the MOC has chosen to represent their flag restoration to their membership. I think that is fairly authoritative. However, I additionally show how the MOC has represented this preservation effort to the SCV and how their effort is perceived by their target audience. I think the evidence is fairly comprehensive. Your numerous visits to the MOC document how the MOC has represented themselves to you. It doesn’t seem to occur to you that the MOC represents themselves differently to different audiences. Also, having established a personal relationship with the MOC, I can see how this colors your perceptions. This is the basis of good ole’ boy networks. So you have schmoozed with them, so what? Having a person with museum expertise visit and report on the MOC is much better than me visiting. Someone who visits without being fetted by the MOC. It seems to me you wish to make this a central focus, whether I visited or not, to avoid discussing the material facts in my essays. I am quite aware that the neo-Confederates are upset. It discussed in the 2nd installment. The MOC acts to further its institutional interests. To act such that the neo-Confederates would be happy would totally discredit it with other audiences and end financial supprt from other organizations. However, the neo-Confederates aren’t the only audience or potential support base for the MOC, and the MOC, isn’t stupid and has figured this out. There are other audiences and interests and what called popular interests incorporating Lost Cause views that would and do find the MOC quit satisfactory. You might consider that tha MOC represents itself differently to different audiences. When I annouced that I was writing the paper I made reference to my paper on Banal Nationalism, http://www.templeofdemocracy.com/breaking.htm and your response was that there was nothing about the MOC in it. Of course there wasn’t. It was a reference to a phenomenon which gives a free pass to certain practices if they aren’t overt. You missed the whole point. As the Civil War Round Tables start coming to an end consider how your attitudes might be perceived by the coming generation. I have acknowledged more than once that the MOC must deal with a number of constituencies with different agendas and that maintain often conflicting relationships to a past that we can all agree is nothing less than a mine field. Rather than explore how the MOC attempts to work and maintain a relationship with these different constituencies you offer a narrow reading of one that is unconvincing given the amount of evidence you provide. Interviews with staff members are indispensable for such a project yet you admit to never having even visited the museum. That you are asking to be taken seriously is laughable. Edfish is the mirror image of those Lost Causers he rails about. He has a zealot’s self-assuredness that leads him to see everything in a narrow light. The MOC is a fine museum which I’ve visited several times and I’ve never found anything to offend my blatant Yankee sensibilities nor anything I think would offend others who were looking to take offense regardless of what and how the past is displayed. Ed. Ironically you and the SCV/UDC/LOS crowd are in agreement on one thing. You all assume the MOC exists to glorify the CSA. Mr. Sebesta is coming at this question from a different angle. Most of the posts here are arguing for a more inclusive narrative of the Civil War which would add voices to the dialogue. If you read his online postings, he is concerned not so much with history for the sake of history as the political ramifications of who controls the narrative itself. In that sense, he’s not so much about adding voices not previously heard as replacing the former narrative with those new voices. The idea is the old narrative “banal nationalism” has to be knocked down and a new one put in its place. Many of us might agree with certain of his points, but the larger question is whether a relatively few people will be successful in limiting the number of voices heard by classifying some narratives as out of bounds. One means of doing that is redefining groups or individuals (like the Museum of the Confederacy) negatively by attaching them to ideas or movements other than how they define or understand themselves. At best this tactic argues they are inadvertently associated with negative viewpoints and at worst accuses them of complicity. Even if I can agree with him on some points, I find the tactic of defining speech in whatever form (including museum exhibits) in such a way as to reduce diversity of expression to be counterproductive. I think you make a really good point. One means of doing that is redefining groups or individuals (like the Museum of the Confederacy) negatively by attaching them to ideas or movements other than how they define or understand themselves. At best this tactic argues they are inadvertently associated with negative viewpoints and at worst accuses them of complicity. The problem is that he has not taken the necessary steps to make his case. I still do not understand why he has not reached out to talk with anyone at the MOC. What exactly is he trying to avoid or learn?